Deluxe 0.25 cm PVC edges. Stylish and practical, this computer desk from Bestar is a terrific focal point for any contemporary office. This piece comes designed with a classic red finish, perfect for pairing with a variety of decor. Constructed from sturdy manufactured wood, this piece keeps your work space well supported. Keep your workspace tidy and compact with this desk. The contemporary appeal of this rich dark taupe wood-look L shape desk, upgrades your home office with functional storage and work space with style. The spacious desk gives you two work surfaces, which can conveniently be assembled on the left or right hand sides, offers space for a computer or laptop, a place to write, read or to spread out documents. The desk also features an abundance of drawer storage, a hutch and 3 open shelves, including an adjustable bottom shelf keeping all of your essential supplies within easy reach. This is a must-have for any home office. Prestige + 59.4-inch x 30.4-inch x 62.7-inch L-Shaped Computer Desk in Espresso No matter what you work on next, be sure you have plenty of space with this computer desk from Bestar. Colored in a beautiful espresso shade, this piece brings a touch of flair to any room. Its manufactured wood frame is designed for lasting durability, providing support for years to come. A computer, notebooks, and more can fit on this compact workspace. 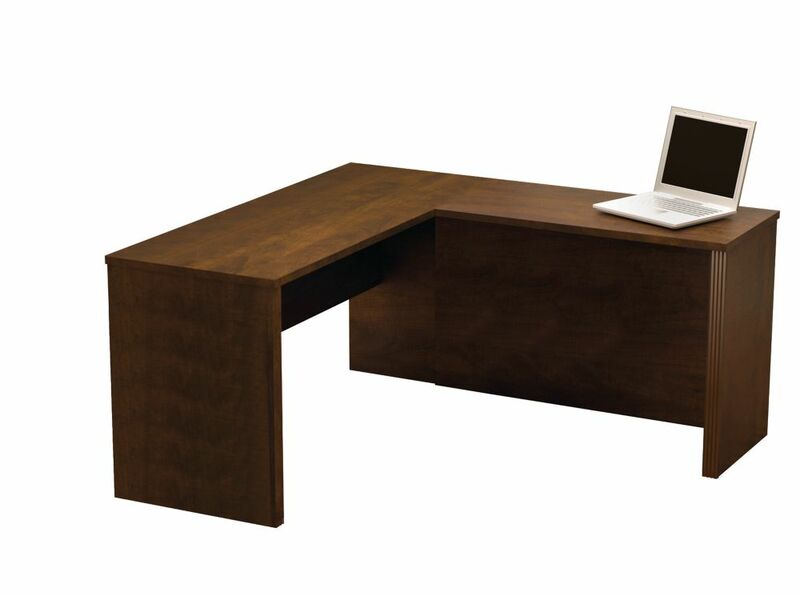 Prestige + 59.4-inch x 30.4-inch x 62.7-inch L-Shaped Computer Desk in Espresso is rated 5.0 out of 5 by 4. Rated 5 out of 5 by Dcoocd from It’s a nice desk. Great workspace for my home office. My dog likes sleeping under it by my feet. Rated 5 out of 5 by michealwj327 from Solid Desk The desk was relatively easy to setup, and is proving an excellent choice for its price. The desk is strong, so it won't collapse as you populate the very spacious desktop surface with computers, monitors, printers or whatever else you plan to put onto it. Rated 5 out of 5 by David from Well built, high quality desk, easy to assemble We bought this for an executive in our office and it is a great desk. I assembled it and it is easy to assemble with very good documentation and lots of spare hardware. HIgh quality and obvious great engineering. This will serve us well for many years. It can be converted to any L shape required, left or righ. Rated 5 out of 5 by Dea1 from Impressed! The desk took a bit longer than expected to come, but was well worth the wait. It was quick and easy to put together. It is strong and looks great. Excellent desk for how inexpensive it is. Would definitely buy again.